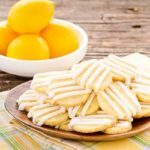 Meyer Lemon Butter Cookies are a delightfully sweet treat. They are slice and bake cookies with a rich, buttery, and bright lemon flavor. Combine sugar and lemon zest in a small bowl. Use your fingers to rub zest and sugar together. This releases lemon oil for more flavor. Whisk together flour, salt, sugar and lemon zest in a large bowl. Add butter and cut into flour mixture using a pastry cutter until it looks like coarse crumbs. Add lemon juice and egg yolk. Use a fork to combine. Transfer the dough to a work surface. Knead and press the dough until it forms a ball. Keep pressing until it comes together. Divide the dough in half. Form each half into a log 5-inches long and about 1-inch in diameter. Wrap logs in plastic wrap and freeze for at least 30 minutes or overnight. Preheat oven to 350°F. Line baking sheets with parchment or non-stick liner. Unwrap logs and slice into 1/4-inch thick rounds. Place cookies on baking sheet 1-inch apart. Bake for 10 to 12 minutes, until the edges just begin to lightly brown. Transfer cookies to a wire rack and cool completely. Drizzle glaze on cookies. Stir together all glaze ingredients in a small bowl. Add more lemon juice as needed for desired drizzling consistency. Time stated does not include time for freezing dough.